The IAS posts calls for papers and opportunities to attend other conferences related to Italian Art. If you have a conference or lecture that should be posted here, please contact the webmaster. The Grand Tour, as an educational rite of passage, reached its peak in the 18th century, widening its traveling radius outside of Rome and Italy onto further parts of the Roman Empire, among which Dalmatia held a prominent position. The international interdisciplinary conference on architecture, urban planning, and architectural decoration aims to explore the role of Diocletian’s Palace in the work of Robert Adam, Charles-Louis Clérisseau, and Louis-François Cassas, as well as the influence of Diocletian’s palace on the development of European neoclassicism. Early modern Europe found new fascination in the classical past, but how that past was conceived varied widely. This conference will explore diverse notions of antiquity across Europe in the early modern era, challenging assumptions about a Greco-Roman past and a ‘Renaissance’ that were both universal and monolithic. It is already well known that multiple ‘antiquities’ informed the artistic and literary culture of Rome, Florence and Venice and much recent work has been done on the reception of antiquity in France, Germany and the Netherlands. Our conference will consider how this research has fundamentally changed the perception of European antiquarianism and further explore the reception of the classical past on the local and regional level. European communities considered local antiquities as living testaments to their antique origins, whether real or fictive. They looked not only to Greco-Roman antiquity, but also to the culture of pre-Roman, indigenous populations. Cities and regions shaped their notions of the ‘antique’ not only from a classical heritage but also that of more recent past, as when medieval objects or texts were believed to be ancient or purposely re-fashioned as such. Real or fictive ruins, inscriptions, or literary works could be used to demonstrate a particular idea of the ancient past or as a statement of civic pride. Described in poetry or other texts, antiquities were central to the literary traditions of local communities; works of art and architecture either redeployed spolia of recognizable local provenance or were characterized by a regional concept of the antique. Adopting an interdisciplinary and comparative method, the conference aims to investigate such issues. We seek abstracts for papers that explore local concepts of the antique in the form of archaeological excavations, works of art, architecture, or texts. How were local antiquities used to construct a sense of identity for civic bodies or individuals? How did imported modes of classical revival merge or clash with local idioms? How did local communities respond to or attempt to rival Rome and other heirs to antique traditions? Papers might address issues of competing ‘antiquities’, the character and priorities of local concepts of the antique, or relationships between concepts of antiquity in various regions. They might also consider wider aspects of the local reception of antiquity, such as patterns in myths of origins that recur in different areas of Europe. We would welcome any topic dealing with the impact of local concepts of antiquity in early modern literature, antiquarianism or the visual arts. This 2-day conference organized by Kathleen Christian (The Open University, Department of History of Art) and Bianca de Divitiis (ERC/HistAntArtSI project, University of Naples Federico II) will be held at the Warburg Institute in London on Thursday November 13–Friday November 14, 2014. Questions should be directed to Kathleen Christian and Bianca de Divitiis. 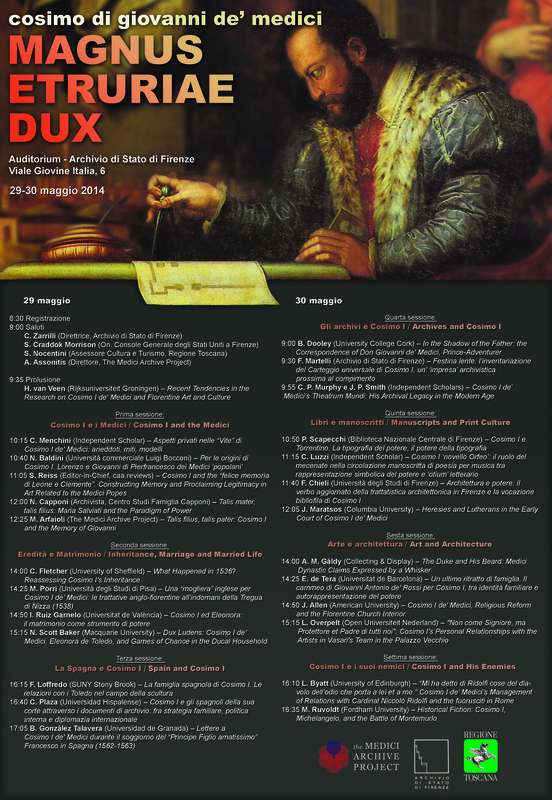 An international conference organized by the Center for Italian Studies and the Music Department of the University of Pennsylvania in collaboration with the Institute for Music of the Fondazione Giorgio Cini in Venice, Italy. For more on the theme of the conference, please see the conference website. Questions may be directed to Mauro Calcagno. Organizing Committee: Fabio Finotti, Mauro Calcagno, Carlo Lanfossi, Marina Della Putta Johnston. Registration Fee: professionals $100; students $70; Closing Dinner: $50. Augustus through the Ages: receptions, readings and appropriations of the historical figure of the first Roman emperor. Augusti Manes volitant per auras. In 2014, many academic institutions and museums will celebrate the bi-millennial of the death of Augustus with colloquiums, exhibitions, and publications. The life, the political ingenuity, and the era of the founder of the Roman Empire have not been honored or discussed in this manner since 1937-1938, when an exhibition, the Mostra augustea della Romanità, at the instigation of the Fascist regime, celebrated the two-thousandth anniversary of the birth of the Emperor. Yet the outcome of the re-examinations in 2014 will not be complete if emphasis is not put on the enduring fame and fortune he experienced in the West, for this renowned figure created an empire which united, for the first time, the Mediterranean with the regions north of the Alps. The importance of this personage throughout our recorded cultural history makes a multidisciplinary approach essential. It is therefore, as diverse field and period specialists, that we wish to invite our Belgian and foreign university colleagues to bring together their skills and knowledge – in the distinct fields of history, cultural history, literature, art history, semiotics, etc. – to retrace the multiple interpretations and appropriations of Augustus from his death to the present days. This colloquium will bring together historians, philologists, archaeologists, and art historians of different periods to present papers on various topics in accordance with the following guidelines: Receptions of Augustan politics and ideology and their appropriations; Religious appropriations; Representations of Augustus in mixed media (e.g. comics, television series); Augustus in literature and the arts, or in movies and on the Web; Memory of Augustus as the “urban designer” who transformed Rome into a city of marble. Questions may be directed by e-mail to Marco Cavalieri. Organizing Committee: Pierre Assenmaker (F.R.S.-FNRS/UCLouvain) Mattia Cavagna (UCLouvain) Marco Cavalieri (UCLouvain/Università degli Studi di Firenze, SSBA) David Engels (ULB, Bruxelles) Costantino Maeder (UCLouvain). From 28 September 2014 to 11 January 2015 the Museo Cantonale d’Arte in Lugano will host a major exhibition consecrated to Bartolomeo Suardi, known as Bramantino. The exhibition traces the artist’s entire cultural and expressive itinerary, from the onset of his career to his very last works. Works of Bramantino will be shown alongside paintings, drawings, illuminated manuscripts, sculptures and goldsmith’s art which represent, in a tightly-knit web of exchanges and interferences, the most important Lombard figurative tendencies within the frame of the Italian Wars and the French rule of Lombardy (1499-1525). Since the exhibition will constitute an important opportunity to re-examine the works of Bramantino and of his contemporaries, the Museo Cantonale d’Arte promotes a two-day symposium to present and discuss the most recent studies of the researchers active in this field. The symposium will take place in Lugano from the 6th to the 7th of November 2014. The symposium aims at bringing together art historical presentations as well as technical and scientific investigations reports on specific works. The proceedings of the symposium will then be published in a volume of the series Biblioteca d’Arte Skira. Promoted by Politecnico di Milano, Dipartimento di Architettura e Studi Urbani / Università Cattolica del Sacro Cuore di Milano, Dipartimento di Storia, Archeologia e Storia dell’Arte. On the occasion of the Fifth Centenary of the death of Donato Bramante (1514- 2014), the Politecnico di Milano and the Università Cattolica del Sacro Cuore propose to dedicate a day of study to new information and interpretations concerning the many unsolved problem of Bramante’s architecture. The Study-Day, to be held nearly thirty years after the conference promoted by the Università Cattolica in 1986 and in collaboration with others intending to celebrate the Centenary, aims at offering the opportunity for a dialogue between scholars, particularly younger ones, by presenting research in progress as well as prospects for future investigations. The aim of the Conference is two-fold: the 500th centenary of Bramante’s death presents an opportunity to invite scholars to present new work that will update the catalogue of Bramante’s work in Milan and Lombardy, as well as promoting at an international level an exchange of ideas and different approaches intended to calibrate the importance, or lack of it, of the presence of Bramante in Milan. Questions may be directed to the organizers by email. The Acts of the Study-Day will be published in a monographic issue of the journal Arte lombards. This symposium in memory of scholar Andrew Ladis celebrates both his love of trecento painting and his commitment to its display, study, and preservation in a museum context. Funded by the Samuel H. Kress Foundation. The conference will open Thursday evening with a keynote address by Carl Strehlke of the Philadelphia Museum of Art and feature speakers from various disciplines and countries, focusing on the interpretation and technical development of gold-ground painting in Renaissance Italy the following day. The museum will host a trip to Bob Jones University Museum & Gallery, in Greenville, South Carolina, on Saturday, October 25, 10$ per person. The conference itself is free and open to the public. To reserve a hotel room at the Athens Holiday Inn or Holiday Inn Express, call 800-315-2621 and mention the “Georgia Museum of Art Trecento Conference.” RSVP by email for the conference and/or trip to Greenville. Thursday, October 23, 2014, 5:30 p.m.
Friday, October 24, 2014, 9:00 a.m. to 5:30 p.m.
Saturday, October 25, 2014, 8 a.m.-4:30 p.m. This International Conference is organized by Accademia Nazionale di San Luca in collaboration with Università degli Studi di Roma 2 “Tor Vergata.” The conference, to be held at Palazzo Carpegna, Accademia Nazionale di San Luca, is dedicated to the architect Carlo Fontana (Rancate 1638 – Roma 1714) on the occasion of the 300th anniversary of his death. The protagonist of Roman architecture as the Baroque was waning, Fontana, descending from a famous dynasty of Ticinese architects, organized the teaching and practice of architecture based on the exercise of drawing and geometry. His workshop thus prefigured modern design studios. The propagandistic usage of engravings and printed volumes illustrating and diffusing Fontana’s works and ideas constituted yet another factor of his modernity. In fact, Fontana understood perfectly the dimension of intellectual and creative freedom of the print, liberating himself from the dependence on patrons and from morphological and typological conventions of his time. The projects of Carlo Fontana range from artifacts of domestic use, interiors, civil, religious and military architecture to the most challenging urban and territorial infrastructures (ports, aqueducts, grain warehouses, etc.). These design and entrepreneurial features are comparable then to the great architectural studios of the 19th and 20th centuries, confirming Fontana’s actuality. Such an innovative workshop organization attracted students from all over Europe: Johann Bernhard Fischer von Erlach, Nicodemus Tessin, Lucas von Hildebrandt, Filippo Juvarra, Francesco Specchi, and James Gibbs, to name a few. In Fontana’s studio students could learn innovative typologies, modern and experimental techniques, at the same time measuring themselves up to the great Roman construction tradition, both ancient and modern. Their direct contact with monuments was favored by the works Fontana executed on antique buildings to make them fit for new usages and new representations. Papers will encompass and explore, but by no means be limited to, the above mentioned aspects, always bearing in mind the cosmopolitan and European horizon that characterizes the production, teaching, and thought of architect Carlo Fontana. Questions may be sent by e-mail message. The Nomadikon Center for the Visual Arts, Bergen, NO and The Center for the Ethics of Seeing, Albany, NY hosts interdisciplinary conference. In his Theory of the Film (1952), Bela Balázs wrote that “[f]acial expression is the most subjective manifestation of man, more subjective than speech.” In the close-up, the Hungarian film theorist and writer saw an image unbound by time and space, thus identifying the point at which the film image could become a concept, a supremely expressive unit of signification closer than other types of images to thought. In contemporary visual culture, the visibility of the face is a given, and some would perhaps claim that its presence has become almost ubiquitous. Consider for instance that in 2013 Oxford Dictionaries named selfie the word of the year. Yet despite its cultural pervasiveness, the face remains a curiously overlooked subject of research in the humanities and social sciences. For this conference, we invite papers from any discipline that engage with faciality and the face as a phenomenological, social, cultural, aesthetic, visual, literary, philosophical, semiotic, historical, and textual object. Particularly welcome are discussions that explore the concept and materiality of the face in the arts, with their rich traditions for representing faciality – photography, cinema studies, art history, literature, dance, theatre and performance, and social media and the digital arts. As an aesthetic category spanning a range of different media, the face often seems potentially self-referential. When drawing attention to itself, the face may become a source of opacity which inhibits the hermeneutic flow, something which strips away all context until the only thing we are left with is its sheer material presence. The filmic face is also enigmatic. The film theorist Richard Rushton (2002) has observed that we tend to suppose that the face is hiding something, that it represents “a surface haunted by intimations of concealment, interiority and exteriority.” Taking the impenetrability of the face as its point of departure, then, this conference encourages submissions on a variety of topics relating to the face and faciality, including but in no way limited to the following: the close-up and its long history in the moving arts (i.e. Dreyer, Bergman, Warhol, Cassavetes, Leone, Godard, Pasolini, Tarkovsky, Egoyan, Assayas and Kiarostami, to name just a few); the face as a mask (the poker face or blackface, but also in Heidegger’s conception of the image—the Latin imago—as a death mask); the face as a site of ethical encounter in the philosophy of Levinas (face-to-face); Deleuze’s notion of the affection-image, or his study of the dismantling of face in the portrait paintings of Francis Bacon; the cinematic reaction shot; the culture of Facebook and the “selfie;” the portrait genre throughout art history; the face as pure surface or exteriority (the face of the earth); the face in relation to ethnicity/race/gender; the digital interface; the various permutations of the look/the gaze/the glance; the face and sexuality; the face of/face and disability; iconicity and the face; the face and ethics; the veiled face; the face and iconophobia – etc. The conference will be held at the Foundry Inn in downtown Athens. This conference is a continued partnership between the Nomadikon Center for Visual Culture, Bergen, Norway and The Center for the Ethics of Seeing, Albany, New York. The previous conference in this partnership was “The Ecologies of Seeing,” hosted in the fall of 2012 at The College of Saint Rose, Albany, New York. Registration for the conference is $130.00. For further information, contact organizers Mark Ledbetter, Susan Cumings, and Theresa Flanigan. Research in the history of collecting has often focused on the development and the uses of historical collections of art and artifacts, their composition and the choreography of display. Over the past decade, the international forum Collecting & Display has been investigating diverse aspects of Collecting History: female collectors, dynastic ambition, the role of nature, or the location of display rooms within the context of princely residences. To celebrate the first decade of our existence as well as the launch of a dedicated series of publications – “Collecting Histories” under the editorship of founding member Andrea Gáldy, PhD, FHistS – we will host a conference dedicated to new directions in the areas of collecting, display, visitor experience and the use of modern media in today’s museums that might or might not dispel with the need to engage with actual objects, and whether and how the engagement with the history of collections has influenced and modified contemporary museology. With this event we intend to look forward towards a future, which oftentimes looks bleak due to funding cuts but also offers exciting prospects as far as the diverse possibilities of display are concerned; not to forget the rising visitor numbers at many of the great museums worldwide. What is the mission of collections and museums? And, how does one balance the history of collections and the collections themselves against the need for outreach activities, the call for edutainment and popular access in conjunction with a sustainable use of collectibles? Is there a way in which the past of a collection may point the way towards the best practice in use and presentation of the exhibits? Questions may be directed to Dr. Andrea Gáldy and Dr. Axel Lapp. Memmingen is easy to reach by train via Munich or Stuttgart/Ulm as well as by plane to the Allgaeu Airport. On the occasion of the exhibition Paolo Veronese. L’illusione della realtà (Verona, Palazzo della Gran Guardia, 5th July – 5th October 2014), curated by Paola Marini and Bernard Aikema, an international conference will take place to discuss the new points of view on Paolo Veronese as emerged during the two monographic exhibitions in London and Verona. A poster session will run simultaneously to the conference. Among the increasingly monarchic arena of Early Modern Europe, the powerful Italian cities of Genoa, Rome, and Venice are exceptional. Genoa and Venice, the largest remaining republics in Italy, predominated the financial, mercantile, and military spheres of the Mediterranean. Rome’s religious authority and historical cachet, along with its sizable territory, were the foundations of its leading position. All three of these cities stand out for their oligarchic power structures; while Genoa and Venice were led by governments elected from a restricted book of families, Rome fostered an aristocracy both parallel to and participating in the electoral principle of the Papal court. Therefore, in the absence of hereditary lords, power and prestige was shared among the ruling families. As a result, in all of these cities, the families could remain powerful even as the government changed. Central challenges for these cities’ aristocratic families were how to figure their relationships to local power structures and balancing their own interests against those of the communal state. The particular social-political contexts nurtured different forms and strategies of representation than those deployed in monarchic and ducal societies. The oligarchic aristocracy had to submit to an abstract concept shaped by values and virtues such as equality and liberty rather than to a dynastic authority. Each of these societies experienced turning points when their political structures shifted and opened to new families—be they from outside the city or from non-noble stock—and their ruling classes sought new methods of representation and patronage to assert their role in the changed social scene. The reforms of 1576 to Genoa’s oligarchic government, the rising status of papal families in seventeenth-century Rome, and the opening of the Libro d’Oro in the context of Venice’s wars against the Ottoman Turks in the late seventeenth century were all moments from which such changes arose. Against this background, this study day seeks to compare the demands and strategies of art and architectural patronage among these non-dynastic aristocratic groups. Although Genoa and Venice have often been mentioned in chorus, they have never been directly and critically compared. Because of their diverse political alliances and statuses, the differences in their governmental structures, as well as their differing territorial dispositions, two distinct types of an early modern republic developed. Furthermore, the exemplary role of Rome for the non-monarchic sphere—its permeable system of social ascension—still asks for a more differentiated view. For more information, please visit: www.biblhertz.it. Questions may be directed to Benjamin Eldredge (Bibliotheca Hertziana) and Bettina Morlang-Schardon (Bibliotheca Hertziana). At the occasion of the 75th anniversary of the Academia Belgica Conference organized by the Academia Belgica (Rome), with the support of the Belgian Historical Institute in Rome, and the Princess Marie-José Foundation, an international conference with confirmed keynote speakers: Wim Blockmans (Leiden University), Christophe Imbert (University of Toulouse-Le Mirail), Martin Kohlrausch (KU Leuven), Christoph Schönberger (Konstanz University). Publication of the proceedings will take place after the selection and evaluation of the definitive papers. At the heart of the present conference will be the ‘reception’, ‘Nachleben’ or ‘permanence’ of the Roman Empire, of an idea and a historical paradigm which since Classical Antiquity has supported the most widespread claims to obtain and consolidate power. The focus will be on ‘culture’, this latter concept intended in a broad sense, i.e. including not only the arts, architecture, literature etc., but also philosophy, religion and, most importantly, discourse. As such, a wide array of themes will be subjected to academic scrutiny. Whereas the main focus will be on Europe and North America, this conference will also reach out towards non-Western contexts, whether or not directly related to the Roman example. A theoretical and sociological dimension will join, and ideally integrate, the discussion, by means of the involvement of methodological issues relevant to the conference theme. More specifically, the following question(s) will receive particular attention: what is our position as researchers, embedded in a contemporary, often Western, democratic and capitalist context; what about the notion of empire itself, its constituent elements and the kind of ideological prerogatives to which it is generally subjected; in other words, apart from the many historical variants and instances of reception of empire, through which filters can, and inevitably do we approach this topic? Because the world has changed ever more radically since the beginning of the 21st century: after the dissolution of the Soviet Union, the events of September 11, 2001 have inaugurated a revivified American ‘imperialism’, whereas at about the same time an essentially economic variant, driven by ‘emerging’ powers such as China, has increasingly contested existing power structures. In light of such meta-historical awareness, the present conference will as much inform about the nature of the Roman Empire as it will about its historical legacy and, more importantly so, those who claim the latter inheritance throughout the most diverse epochs. Indeed, by discussing some highly contrasting views upon this topic, participants will explore issues that are of fundamental importance to the writing, creation and negotiation not only of cultural history, but also of history itself. The conference will consist of a series of thematic sessions, each of which will offer viewpoints originating from the most varied temporal and geographical contexts. Questions may be sent by e-mail. Session °1: Rome and its heritage. The legacy of the Imperium Romanum in European culture from Classical Antiquity to the rise of the European superpowers (1st century-19th century CE) In ancient Rome, the idea of empire was carefully crafted in the late republican and early imperial period and it proved resilient throughout European (and later also American) history. Roman imperial performance became the cultural and political hallmark for the aspirations of medieval kings and emperors of the feudal era, for rising State power across the early modern period and for European colonial expansion from the sixteenth century onwards. Imagery and rhetoric mirrored the great classical authors and politicians. Roman architecture set the scene for demonstrations of power and ideology. If the renovatio imperii inspired early Western monarchs like Charlemagne, it was Roman law that catered for State centralization of the rising European States from the late Middle Ages onwards and laid the foundations for State power and the authority of the prince, as well as for the attitudes of kings and dukes during the Renaissance. But at the same time ideas of republicanism and resistance against power yielded by one level of authority also claimed descent from Rome. Indeed, as further exemplified by, most notably, the growing interest in the Roman Empire during the Enlightenment as well as under Napoleon I (see also Ingres etc. ), the historical exemplum offered by the Roman Empire is of an extremely versatile and multifaceted nature, and its applicability cannot by any means be confined to one single interpretation. Session °2: Radically changing perspectives on a historical category: the Roman Empire in the contemporary era Since the French Revolution, which, in a process of ‘nationalization of the masses’ (Mosse), posited the interests of the people at the core of political and societal debate, the heritage of ancient Rome has been the object of intense negotiation. In this period of high stake discussion concerning the boundaries and legitimacy of individual and collective power, nations and empires were created. Throughout the 19th and 20thcenturies, ancient Rome was a historical predecessor from which lessons could be learnt, examples drawn. Whereas on a sociological level, Roman republicanism inspired much fervour, arguably the idea of empire has subsequently been responsible for most of the key defining moments in world history: from instances of aggressive nationalist politics in the nineteenth century to the twentieth-century rise and fall of popular, fascist and communist power structures, from the definitive sanctification of the USA as the only real Western superpower in 1945 to its virtual omnipotence during recent years, from colonialism to post- and neo-colonialism, Roman imperialism has lost none of its relevance, whether as an historical exemplum or, alternatively, as an ominous caveat. This session intends to further explore the current, and indeed also future, fate of the Roman Empire, offering as it does various assessments of how contemporary civilizations have claimed, shaped and also radically rejected, the cultural heritage of Rome in their struggle for power and legitimacy. Session °3: The imaginary empire. Performance and representation of power In the visual arts, the reference to the Roman Empire has always maintained a certain relevance, whereby the exaltation of imperialist-monarchic power has continued unabatedly in subsequent epochs, starting with the medieval Byzantine, Carolingian and Holy Roman Empires. At the same time, pagan figurative models were adapted in order to meet the ideological requirements of Christianity, a process which led to vociferous debate regarding the status of imagery, as well as, ultimately, to instances of iconoclasm. Consequently, the Renaissance has intensified the interest in Graeco-Roman antiquity, in search of a pureness which was often more the product of imagination than a tangible reality. Through a certain interpretation of Vitruvius, attempts were also made to rival with Roman imperial architecture, as a testimony and legitimisation of power and authority. Culminating in the so-called Querelle des anciens et des modernes, the appropriation of antiquity has indeed remained a core issue in art history throughout the centuries. Various explorations and transformations of the highly realistic formal language of Roman art, the sublimation of the arts by totalitarian States and Empires (from Charlemagne to Napoleon, from Stalin to Hitler and Mussolini), modern interpretations of artistic theories have been founded on the myth of Greek but also Roman antiquity. It is to the exploration of such themes that this session is dedicated, whereby participants will trace their presence in the visual arts, music, and literature. Session °4: Empires without Rome? In contrast to European (and American) empires, the idea, and performance, of empire as inspired by ancient Rome was less obvious outside the Western world. Yet some imperial development in the Islamic world (the Ummayad and Abbasid caliphates in the Middle Ages and the Ottoman empire from the fifteenth century onwards) built on art, images and administrative concepts of the Imperium Romanum (and its direct successor in the Eastern Mediterranean, the Byzantine Empire). In other parts of the world, classical Rome was only heard from a great distance or was even a foreign concept. This session wants to explore how the idea of empire was lived in China, the Indian subcontinent, and in the Islamic World. Did Han, Tang, Sung, Ming or Qin China develop different concepts or performances of empire or were Mongol tribal organization or Mughal India with its Islamic foundations influenced, through their contacts with Abbasid, Fatimid, Mamluk or Ottoman empires, by older Roman ideas? And finally, when in the course of the 18th and 19th centuries European colonial power invaded these very different empires, did the European, and therefore Roman, concept of empire transpire in local culture, i.e. traditions of representing and performing imperial ideology? Alternatively, this session will also allow for discussion concerning empire ‘without empire’: in an era of unprecedented global economic crisis, in a world that has become a ‘global village’, globalization and international financial capitalism have been characterized as the most recent translations of empire, of the interplay between personified ‘financial markets’ which herald the advent of a reinvented kind of empire. Recent scholarship in the history of information, art, and science has emphasized how knowledge and ideas flowed in varied ways and circulated between people of different social status with distinct levels of formal education and access to power. This interdisciplinary conference seeks to explore in greater depth the ways that material spaces of the early modern city functioned to facilitate cultural encounters and the nature of these exchanges. Where did the exchange of knowledge take place (from workshops to streets to bridges to classrooms to marketplaces to churches, etc.)? Was the physical arrangement of these places conducive to interaction (e.g. openness to street; benches outside)? How open or closed were spaces to different kinds of people? What sort of information did city dwellers and travelers seek and why; what knowledge and information did they bring to these encounters and what did they receive? Were ideas shared openly and how was information demonstrated? How did visitors participate (did they simply watch or did they take part)? We hope to uncover cases of unexpected encounters (in terms of participants and information) by using creatively the surviving evidence (e.g. graffiti, architecture, marginalia, sketches, books of secrets, ricordanze, archival records, etc.). In addition we aim to illuminate the ways in which the activities and vocabulary of different spaces permeated multiple disciplines and discourses (e.g. politics, poetry, philosophy, etc. ), often generating new ideas. Speakers: Niall Atkinson (Chicago), Christina Neilson (Oberlin College), Nick Terpstra (Toronto), Yvonne Elet (Vassar College), Nicoletta Marcelli (Macerata), Cecilia Hewlett (Monash), Roisin Cossar (Manitoba), Tom Cohen (York), Elizabeth Cohen (York), Dario Tessicini (Durham), Filippo De Vivo (Birkbeck). Click here for full program. Advanced registration for the conference is necessary. Please register online by September 1, including your name and institutional affiliation. Due to budgetary restrictions, lunches are open to presenters and discussants only. This conference is generously funded by The Lila Wallace – Reader’s Digest Special Project Grant from Villa I Tatti: The Harvard University Center for Italian Renaissance Studies and a Connection Grant from the Canadian Government’s Social Sciences and Humanities Research Council. Thanks also to the University of Manitoba’s Institute for the Humanities and Department of History. In theories of looking at art, spectators are usually assumed to be static, having arrived at a correct viewing position before a given work of art. Yet in our experiences of art, vision, and movement are inseparable. Travel is often a prerequisite to putting oneself in a position to be able to see something, or to see it properly; physical effort is required to address the object or image appropriately. Works of art usually inhabit spaces which necessitate adjustment of the viewer’s position. Institutions of art require active engagements such as entering, scanning, exploring, traversing, perusing, surveying, and other forms of behaviour or gestures. When such contingencies of viewing are acknowledged, the question arises as to whether the idea of a static viewer engaged in motionless contemplation is a Modernist, ocularcentric paradigm that fails to take into account movements of the body as a precondition to sight. This conference explored the role(s) of physical movement in creating an art viewer, among other questions. Is there a difference between ‘viewer’ and ‘spectator’? Does one term imply a more active or passive role than the other? Does either term imply motion? We welcome and encourage studies of all periods and locations. Suggested lines of inquiry include but are not limited to the following: The language of looking Correct positions: the ideology and practices of viewing positions Anamorphosis: the image as at once coded and controlling Narratives and itineraries of viewing art Instances, objects, structures that demand a viewer’s movement in order to see Sustained ways of seeing First impressions: the moment of encounter Glimpse versus gaze Modes of scanning and surveying Art History on the run: from biennales to pilgrimage The traversal of surfaces Mobility in digital terms Stasis and mobility in panoramic vision. Questions should be directed to Ting Chang and Richard Wrigley. The Centre for Reformation and Renaissance Studies (CRRS) celebrated its fiftieth anniversary with a conference in honor of Edward Muir, whose innovative studies of Venetian politics and culture helped to establish cultural anthropology and ritual as major analytical frameworks for scholarship on early modern European history. Building from Muir’s contribution to the field, the conference focused on the significance of the methodological changes that have characterized early modern research in history, literature, and art history over the last thirty years and reflected upon how these changes have affected our understanding of the importance of the period. Topics exemplified new directions of critical inquiry spurred by the methodological developments over this period, including the meaning of popular culture, the role of gender, micro-history, the discovery of the body, the importance of ritual, and how methodological innovations in early modern scholarship—particularly in recent years—have informed changes in the nature of humanities inquiry, broadly conceived. The art of Botticelli is at the very center of Renaissance scholarship. While iconographic studies have greatly enhanced our knowledge of the artist’s imagery and its intellectual context, the complex interpretative literature has obscured our perception of Botticelli as a Florentine citizen, painter-craftsman, and entrepreneur. Putting less emphasis on the world of ideas, this conference sought to address crucial issues in understanding the concrete dimension of Botticelli’s artistic activity. The speakers explored four facets that bring together new trends of investigation: his working methods and technique; his drawing practice; his commercial strategies; and his relationships with neighbors, patrons and friends. Over the past decades Botticelli’s paintings have been subject to considerable technical analyses that have highlighted the painter’s extraordinary skills. During the conference new findings were presented, including the recently discovered underdrawings of the Munich “Pietà”. Furthermore, his use of drawings on paper and parchment will be re-evaluated in terms of their attribution, style and function. Finally, the conference sought to address the complex issue of Botticelli’s painting practice in relation to production costs, artistic competition, and social factors such as honor, friendship and reputation. Ties of obligation, patronage, and friendship forged by Botticelli help to explain the more immediate local realities of his career’s development. As to his relationship with Angelo Poliziano, attention was drawn to the question of how Poliziano used to communicate with those around him by means of a close examination of his teaching methods. For full program of speakers, please visit conference website. Keynote Speakers: Barbara Spackman (University of California, Berkeley); Kate Lowe (Queen Mary, University of London). At the end of the nineteenth century, Venetian glass-makers made many of the beads offered by Europeans to the inhabitants of the territories they were in the process of conquering. This lucrative trade thus implicated Italy in a colonial project which extended beyond discrete national boundaries. This small but resonant example of international entanglement suggests the direction which this interdisciplinary two-day conference, to be hosted by the Italian Department at the University of St Andrews, aims to follow. What does it mean to participate in a colonial or imperial enterprise which is not easily identified as a national project? What does it mean for a national culture to inhabit the imperial discourse of another? How do cultures and people move in, and out, of empire? By attempting to identify instances in which Italy came to participate in colonial or imperial projects, sometimes but not always its own, we work towards an understanding of metropolitan imperial culture as a formation which stretches beyond borders. We are particularly interested in imperial cultures or discourses of power which remain concealed, or at least unacknowledged. The conference explored the following topics: Economic Imperialism: Networks of cultural and economic exchange; Cultural and commercial markets: Visibility and distribution; Desire and gender; Language and power; Imagining Empire in popular culture; Blackness and Whiteness; Traces and residues. Questions should be directed to organizers Derek Duncan and Emma Bond. The Annual Symposium on Medieval and Renaissance Studies at Saint Louis University provides a convenient summer venue in North America for scholars in all disciplines to present papers, organize sessions, participate in roundtables, and engage in interdisciplinary discussion. The goal of the symposium is to promote serious scholarly investigation of the medieval and early modern worlds. Papers, sessions, and roundtables on medieval and early modern studies. The plenary speakers for 2014 were John W.Baldwin, of Johns Hopkins University, and Robert Hillenbrand, of the University of Edinburgh. Cabinets of prints and drawings belong to the earliest art collections of Early Modern Europe. Some of them achieved astounding longevity such as the Florentine Gabinetto Disegni e Stampe at the Uffizi. The fame which they acquired then demanded an ordered and scientific display. Keepers were employed to ensure that fellow enthusiasts as well as visiting courtiers, diplomats and also artists might have access to the print room. Documenting an encyclopaedic approach to knowledge, prints and drawings often depicted parts of the collection in the form of a paper museum. They spread its fame, and with it the renown of its owner, across Europe and into new worlds of collecting. Themes of this conference included the importance of such collections for the self-representation of a prince or connoisseur; the reliability of the presentation of a gallery’s picture hang in prints and drawings; differences in the approach to collecting, presentation and preservation of prints and drawings in diverse parts of the world as well as the afterlife of such collections to the present day. International scholars were present, the conference language was English. The program included an excursion to the Burg Trausnitz, Landshut. Click here for conference program and more information. Pilgrimage to Christian holy sites and shrines was a mainstay of western European life throughout the medieval and Renaissance periods, and the journeys to places such as Canterbury, Santiago de Compostela, Assisi, Rome, and Jerusalem informed a devotional tradition that encouraged participation from all social classes, evoked commentary by chroniclers, playwrights, and poets, and inspired artistic, iconographic, and literary expressions. Even when the faith-based culture of the Middle Ages began to transform into the more empirical (and experiential) centuries of the Renaissance and Protestant Reformations, pilgrimages were still very much on the minds of writers and geographers as a source of both inspiration and criticism (Spenser, Shakespeare, Milton, Bunyan, Hakluyt, and Raleigh). Papers and panels addressed the conference theme from disciplines within the late antique, medieval, Renaissance, and Reformation periods (c. 4th to 17th centuries) with historical, literary, scientific, archaeological, and anthropological inquiries of pilgrimage, especially in the following subject areas: holy sites and shrines; cults of relics and saints; salvific aspects (healing, science, medicine); gender studies; geographical reckoning (faith-based vs. empirical); theological promotion, dissuasion, and contestation; mystical and philosophical beliefs (and criticism); internationality; secular vs. clerical approaches; considerations about (and representations of) space; relevant aspects of communitas and liminality; travel and communication; and, finally, intellectual history. Questions may be directed to the conference’s co-organizers: Kim Klimek and Todd Upton. 58th Annual Meeting of the Renaissance Conference of Southern California. Keynote Speaker Adam Knight Gilbert Director of the Early Music Program Thornton School of Music, University of Southern California. Keynote Speaker: Alessandro Carrera “Cinema and the Aesthetics of the Sublime,” University of Houston. In a world that is made relentlessly more composite and multidimensional, the intersecting of art, cinema, music, and literature can help us re-configure rhythmically and synergetically the dissonant and discrete realities in which we are immersed. The mathematical concept of the intersection or the visual image of a multiple road junction provide us with both a figurative and conceptual framework for the investigation of how our understanding can be solicited intellectually and artistically by boundary crossing, cooperative practices, and kaleidoscopic experiences. Art, literature, music, and cinema in Italy have always pointed towards innovative ways in which to intersect and interact, producing new experiential and epistemological paradigms. Intersections aims at exploring Italy’s imaginative and idiosyncratic collaborations in and between the arts, to reveal how unconventional contacts, exchanges, and relations can implode the limits of the imagination and the creative process, and ultimately expand the horizon of the known and the knowable. Comparative and interdisciplinary analyses pertinent to Italian and Cultural Studies, Film studies and the Arts are welcome and may encompass literature, Italian-American studies, history, art history, philosophy, anthropology, music, political science, religion, gender studies, and any other relevant discipline. Possible topics may include but are not limited to the following: Music and its Intersection with Culture in Its Various Expressive Forms: (from Nono and Berio to Visconti-Prasca, from Vecchioni and De Andrè to De Gregori and Pino Daniele); Literature: Italian Studies, Post-Modernity, Feminist Theory, Post-Colonial studies and their intersection with cinema, music, the arts but also with politics, cultural practices, and socio-economic phenomena. In addition, theoretical intersections can be drawn from the debate on issues involving Globalization, Global/Local/Glocal; Art: Contemporay trends in art (arte povera, post-structuralism,-post-modernism) as they intersect with music, literature, cinema, architecture, and urban studies; Cinema and its Intersections with Literature, Art and Music: (from Visconti and De Sica, to Fellini, Pasolini, Bolognini, Risi, Rosi, Bene, Olmi and the Taviani brothers, from Salvatores and Costanzo to Martone). Questions may be directed to the Organizing Committee by e-mail. Study day hosted at the Museo Correr, Sala delle Quattro Ponte, 15:00-18:30. 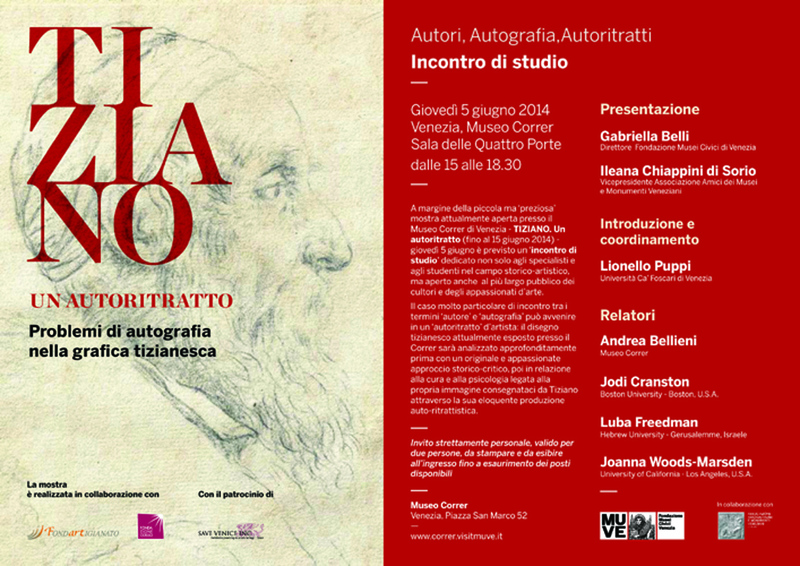 In conjunction with the exhibition Tiziano. Un autoritratto, the Museo Correr hosted a one-day conference with presentations by Gabriella Belli, Ilana Chiappini di Sorio, Lionello Puppi, Andrea Bellieni, Jodi Cranston, Luba Freedman, and Joanna Woods-Marsden. Click icon at left to see full program. Archivio di Stato di Firenze. Much has been written about the institutional, economic, and cultural politics of Cosimo I de’ Medici’s duchy during the nearly four decades of his rule. However, only in recent years have scholars begun to assess Cosimo I’s more personal sphere, largely thanks to work on the correspondence in the Medici Grand Ducal Archive (Mediceo del Principato), housed at the Archivio di Stato in Florence. Thousands of letters written by and about the duke paint portraits as intimate and revelatory as those painted by Agnolo Bronzino. Details about his personality and his relationship with family members are constantly emerging. These letters also record his physical maladies and psychological distress, his cynicism, his humor, and his compassion. They speak of his aesthetic tenets, intellectual curiosity, military values, and culinary predilections. Letters address his obsession with his enemies, his conflicting relationships with foreign regents, and his dynastic ambitions. Most importantly, they shed light on the intricate mechanism of court culture, which saw Cosimo I at the epicenter of his rule. In an effort to retrace Cosimo I’s personal dimensions, the Medici Archive Project and the Archivio di Stato of Florence organized a two-day conference. In addition to the topics mentioned above, the following themes were addressed during the conference: • education and humanism • self-representation and identity • family and diplomatic networks • communication and information • collections and decorum • health and religion • decadence and domesticity • self-preservation and self-indulgence. Questions may be directed via email to Maurizio Arfaioli and Samuel M. Gallacher. Click on the icon at left to view full program. The Sixth International Symposium on Psychoanalysis and Art was held in the Salone Magliabechiano of the Uffizi Gallery and other venues in Florence. The symposium presented a unique interdisciplinary meeting of art, music, psychoanalysis, and neuroscience in conversation about those who make art, who see it, and who pay for it. Featured speakers include Stefano Bolognini, Amy Fine Collins, Jane McAdam Freud, David Freedberg, Vittorio Gallese, and Laurie Wilson. For registration and program information visit the symposium website. According to Jean-Claude Schmitt, “the dead have no existence other than that which the living imagine for them” – and sometimes, the living not only force them to exist in their memory but also to persist materially. By keeping the mortal remains above the earth, by dividing them, manipulating them and moving them to different places, the deceased are assigned a very active role within the world of the living. The title of this workshop includes, however, also a second “species” of migrating bodily fragments, namely body parts that are imagined to be moving by themselves. We are not sure whether the movement of real, physical body parts can reasonably be linked with the stories of actively wandering body parts as they can be found in hagiography, secular badges and popular literature of the time, but from our perspective it seems worthwhile to think about it, the more so as for some years now there has been developing a broad area of research on objects that move and migrate. Within our workshop the following perspectives on body parts in pre-modern Europe might be addressed: the reasons why body parts were moved, the way in which they were moved, how they were visualized, the nature of the transport media, both visual and material, the benefits of body parts transcending space and time, which body parts could be imagined to be moving. Organizers: Romedio Schmitz-Esser (Historisches Seminar der LMU München), Urte Krass (Institut für Kunstgeschichte der LMU München), and the Munich Research Center Foundations of Modernity. Questions should be directed to Romedio Schmitz-Esser (Historisches Seminar, Ludwig-Maximilians-Universität München, Geschwister-Scholl-Platz 1, 80539 München). The 2nd annual Mediaeval and Renaissance Conference “Othello’s Island” is organized by academics from the Cornaro Institute, University of Sheffield School of English, and the University of Leeds School of Fine Art. It was an opportunity to discuss diverse aspects of this fascinating period in Mediterranean and Levantine history with colleagues and research students from around the world. As a multi-disciplinary conference, art, literature, and other cultural studies are all welcome topics, as are historical studies, archaeology, cultural and material history, social history, and other topics. Although based in Cyprus the aim of the second conference is to expand our investigations into the wider Mediterranean and Levantine region, and to also encompass aspects of Byzantine, Crusader State, and Muslim cultural and social histories during the Middle Ages and Renaissance. A major strand is Cyprus and/or the Mediterranean in art, literature and other culture in the period, including their presence in the work of Shakespeare and other writers. Cyprus is, after all, the island of Othello (in a manner of speaking). The Society for Renaissance Art History at the South-Central Renaissance Conference. Please join us in Tucson for Exploring the Renaissance 2014: An International Conference, the 63rd annual meeting of the South-Central Renaissance Conference. The Society for Renaissance Art History sponsored sessions on a wide array of topics related to Renaissance art from the fourteenth through seventeenth centuries. Program participants were encouraged to submit publication-length versions of their papers to the SCRC journal, Explorations in Renaissance Culture. Questions may be directed to the website or by email to Caroline Hillard. A one-day conference organized by Andrea M. Gáldy with Lauren Johnson and held at the British Institute of Florence to accompany the exhibition “Pontormo and Rosso. The Diverging Paths of Mannerism.” The exhibition was curated by Carlo Falciani and Antonio Natali (8 March-20 July 2014 at Fondazione Palazzo Strozzi). Jacopo Pontormo (Jacopo Carrucci) and Rosso Fiorentino (Giovanni Battista di Jacopo di Gasparre) trained with the Florentine painter Andrea del Sarto in the early years of the sixteenth century. During these politically turbulent years after the French invasion and the cacciata of the Medici, diverse Florentine governments for and against the Medici rose and fell while two Medici popes ruled over an increasingly rebellious Christendom. Rosso eventually left Florence for Rome and, after the Sack of the Eternal City, moved to Northern Italy and finally to France where he worked at the court at Fontainebleau. Pontormo stayed in Florence apart from a visit to Rome. Sponsored by some of the leading families of Florence, such as the Capponi and the Borgherini, he also received intermittent patronage by the Medici. Eventually he became of the main artists at Cosimo I de’ Medici’s developing court during the early years of the young duke’s rule. Rosso (with Primaticcio) founded the School of Fontainebleau, whereas Pontormo established a “dynasty” of Mannerist court painters through his successors Agnolo Bronzino and Alessandro Allori. Both Rosso and Pontormo were responsible for the development of a new painterly style, the early maniera, which was much influenced by the art of Michelangelo. Religious reform and violent political events, such as the Sack of Rome and the siege of Florence by imperial troops in 1530, have been used to explain the radical departure from High Renaissance art. As young men Rosso and Pontormo set out to revolutionise art; their religious works of art, in particular, were considered to be either highly original or downright controversial. This one-day conference sought to explore the oeuvre of the two artists, surviving as well as lost, with a special focus on the works of art brought together for display at the show at Palazzo Strozzi in spring 2014. This conference is intended as an interdisciplinary forum for discussion in which Pontormo and Rosso Fiorentino specialists presented new research alongside experts from other fields who wish to take their findings to the art of Early Florentine Mannerism. Questions should be directed to the organizers. Click here to see the program. New York University’s Medieval and Renaissance Center invites proposals for papers that address the topic of “mediality” with respect to any medieval or early modern cultural practice or practices. The term mediality refers to a new approach in the discussion of media. While we ordinarily associate “media” with communication – writing, images, radio, TV, film — the approach captured by the term mediality shifts the focus to the ways and means of mediation. It accentuates the fundamental fact that access to history is conditioned by media. The goal is less to define what a medium is than to describe medial situations: moments of the in-between, in which something is assigned the function of a medium, and in which mediation occurs or effects of mediating become visible. The concept of mediality can thus open up our understanding of any historical period and is particularly promising for study of the Middle Ages and Renaissance, periods that are already marked by an intense interest in media, including the exploration of the possibilities of mediation and the development of new medial forms. The concept helps us to understand almost any object of study from these periods: from professional practices such as the law, to cultural practices such as ritual, to concrete material artifacts such as textiles, to the threshold between the age of manuscript and the era of print. Papers investigating the mediality–the specific “in-betweeness”–of any cultural phenomenon are welcome as well as those that investigate such matters as media awareness, media interference, cross mediality, media and the senses, media and power, and the uses and abuses of drawing attention to the conspicuous mediality of in any object, belief, or practice. Questions should be directed to Martha Rust. Keynote speakers: Susanne Kuechler, Professor of Material Culture in the Department of Anthropology, UCL and Alina Payne, Professor of the History of Art and Architecture, Harvard. The descriptive terms ‘decorative’ and ‘ornamental’ are in many ways synonymous with superfluity and excess; they refer to things or modalities that are ‘supplementary’ or ‘marginal’ by their very nature. In the West, such qualitative associations in made objects intersect with long-standing and inter-related philosophical oppositions between ‘form’ and ‘matter’, ‘body’ and ‘surface’, the ‘proper’ and the ‘cosmetic’. Accordingly, this has weighed both on determinations of value in artistic media, and on the inflexions of related histories – particularly histories of ‘non-Western’ art, design and culture, where a wide range of decorative traditions are deemed unworthy of critical attention. Yet such frameworks are no more historically stable than they are culturally universal. To take one very clear and ‘central’ counter-example, decoration in some strands of Renaissance architectural theory (Filarete, Alberti) emerged as a rigorous codification of meaning, as an essentially functional (political) language. In many ways the history of ornament may itself be seen as a process of marginalisation of such ways of thinking, and the separation of ornament from any form of social practice. This two-day conference sought to explore the various ways in which ornament might be regarded as itself productive of its objects and sites. How might the technologies, techniques, and materials of ornament be related to the conception and transformation of modes of object-making? How might ornament be understood to inform its objects, disrupting the spatial categories of ‘surface’ and ‘structure’, and the temporal models in which ornament ‘follows’ making? What are the relations between ornament and representation, and what is at stake in the conventional oppositions between these categories? What are the roles of ornament in larger dynamics of copying, hybridisation and appropriation between things? In what ways have practices and thinking on ornament staged cultural encounters, and engendered larger epistemological and social models? The conference, with the support of the Henry Moore Foundation, explored the production of ornament across a broad range of historical and geographical contexts. Questions should be directed to Dr Richard Checketts and Dr Lara Eggleton. For the past decade and a half, numerous research projects have rededicated themselves to the key sources of art history and to editing and commenting on early art historiographical writings (Vasari, Bellori, Sandrart, Malvasia). One main difference between earlier attempts which dealt with these authors is a current approach which no longer concentrates on factual and documentary evidence alone, but which aims to reveal the narrative models and literary strategies of such texts as well. This fact may be connected to the self-reflexive modes of modern art historical studies and the attention to its own narrative traditions. Hans Belting’s “The End of the History of Art?” (1983), in particular, led to general questions regarding art historical methodologies – which were followed by various attempts to define the discipline in a new way (under diverging rubrics such as e.g. “kunsthistorische”, “kunstwissenschaftliche”, “bildhistorische” or “bildwissenschaftliche Forschung” in German scholarship). The “Lives” of Giorgio Vasari, published in 1550 and 1568 respectively, have to be acknowledged as an inevitable center of all of these discussions. As a purposeful continuation, the implicit model of reference or the decided rejection, Vasari serves as paradigm to all art historical writings of both the early modern period and modernity. The issues of current art historians (regarding questions such as how specific approaches to works of art are conditioned or how historical processes can be translated into a narrative) are particularly linked to art history’s own traditions as an academic discipline, which in many ways continued Vasari’s narrative: Such is the case of Jacob Burckhardt, who composed his works using excerpts from the “Lives” (“700 tiny notes just with quotations from Vasari […] cut out and put into order”), Anton Springer and Herman Grimm, transforming the artist’s biography into a 19th-century bestseller, and many more. And even if there have been numerous attempts to renounce the ‘Vasari’ of this older tradition, many of the key concepts of the “Lives” still persist as models in current scholarship, being more present (‘Renaissance’) or less (e.g. the artistic ‘school’ of a person or region), intensely discussed or almost ignored. This conference aims for the first time to review Vasari’s role in the formation of theoretical concepts and practices of later ‘art histories’ in its entirety. The proposed time frame covers his early modern followers (besides those authors already mentioned above e.g. Van Mander, Houbraken, Dézallier d’Argenville or Fuseli) as well as the intensive discussion of the “Lives” in the 19th century, when the critique regarding Vasari’s truthfulness led to historical contextualization by Gaetano Milanesi, Carl Frey and Wolfgang Kallab. Not only were national differences in the reception of Vasari’s work have to be considered, but also how this transformed view of Vasari from 1870/1900 influenced the generation of Warburg, Panofsky and Gombrich, whose studies shaped the modern art historical discipline more than any other. By doing so, this look at the “Lives” as model hopefully explained what relevance Vasari’s concepts still hold for today’s interests and practices of art historical studies. Even more crucial, however, is the question of whether the critical revision of this art historiographical model might also open new perspectives for future challenges of art historical studies. Questions may be directed to Alessandro Nova and Fabian Jonietz. The multi-talented Sienese artist Baldassarre Peruzzi (1481–1536) worked productively in Renaissance Rome as architect, stage-designer, mechanical engineer, and painter. Scholarship on his accomplishments and legacy, however, is currently in a state of fragmentation, where case studies of single works in discreet media lead the research. While much new information has emerged over the last two decades concerning Peruzzi’s buildings, the pictorial activity that was the other center of his career has received far less attention in recent years. As a result, Peruzzi’s place among the artistic and cultural circles of his generation is still known only partially. With a thematic focus on the figurative arts, this colloquium hopes to begin a scholarly dialogue that would lead to fresh avenues of inquiry. The purpose of the colloquium is twofold: to reconsider Peruzzi’s figurative oeuvre against questions of artistic practice and critical reception, and to bring together scholars from across the globe interested in revisiting Peruzzi’s figurative works. Download program. Plenary Speakers: Adrian Boas, University of Haifa; Christopher Tyerman, Oxford University. World events continue to bring the subject of the Crusades to a place of prominence and importance. This surge of interest comes on the heels of a renaissance in Crusade scholarship that has greatly expanded our understanding of all aspects of the movement. While a western phenomenon, the Crusades also represented an interactive episode in which diverse cultures — western Christian, eastern Christian, Jewish, and Muslim, among others — came into contact, conflict, and collaboration. The International Symposium on Crusade Studies is organized quadrennially by the Crusades Studies Forum at Saint Louis University to explore and inquire into these questions and dynamics. The Symposium provides a venue for scholars to approach the Crusades from many different perspectives, to present the fruits of new research, and to assess the current state of the field. The nineteenth biennial New College Conference on Medieval and Renaissance Studies program included papers on topics in European and Mediterranean history, literature, art, music, and religion from the fourth to the seventeenth centuries. Further details are available at the conference website. The conference was held on the campus of New College of Florida, the honors college of the Florida state system.